I'm an active hiker, snowshoer, skier, and backpacker. Home base is the Southern Colorado Rockies, where I'll hike from 7000 ft (2100 m) to above treeline, with desert trips to lower altitudes. Six to 12 miles (10 to 20 km) daily is my norm, with elevation gains up to 4000 ft (1200 m). Many of my backpack trips are two or three nights, other trips are longer, and I usually carry about 30 lbs (14 kg). My style is lightweight but not obsessively so - extras like binoculars, camera, and notebook make my trips more enjoyable. The Exped SynMat UL 7 S is a very lightweight air-filled sleeping pad, utilizing an insulating synthetic fill of 60 g/m� Texpedloft microfiber. The yellow top is 20 D Polyester, TPU Polyether Film Laminate, with a honeycomb embossed pattern, and is water repellant. 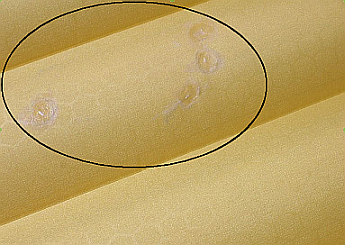 The gray bottom is the same material but without the honeycomb pattern. There are two valves at one end of the bottom, one for inflation and one for deflation; both valves use self-sealing thin flexible flaps to aid inflation, and both have sturdy hinged snap-in plastic caps to seal the air in and keep the dirt out. Eight tubes run lengthwise, and the two outermost tubes are slightly higher (about 0.5 in (1.3 cm)) and wider to provide a "fence" to help keep the sleeper from rolling off. With an R-value of 3.10, Exped rates this pad to 25 F (-4 C). The SynMat comes with a repair kit (stored in its own pocket inside the stuff sack) of instruction sheet, tube of cement, and ample patch material in both mat colors. I measured the packed stuff sack at 3.5 x 10 in (9 x 25 cm), slightly larger than a 1 L water bottle. Exped warranties the SynMat for two years against factory defects. This SynMat is a new item for me this 2014 season, purchased in February, and first used on a three-day backpack trip to the Utah Canyonlands in April. Since then I've camped with this sleeping pad for a total of 10 nights, all inside my tent. This is my first experience with an air mattress, as up to now I've always used some kind of foam or inflatable foam for backpacking. At 64 in (163 cm) long, this mat accommodates my height of 5' 6" (1.68 m) very comfortably, since I'm never stretched out completely. So far I've been out in nighttime temperatures from 25 to 42 F (-4 to 6 C), in conditions ranging from still to windy, dry to rainy. With the pad, at different times, I've used two down sleeping bags: one rated to 20 F (-7 C) and another rated to 40 F (4 C). The SynMat slips out easily from its stuff sack, and unrolling and unfolding it takes just seconds. Inflating the SynMat is easy for me - it completely fills with 12-15 full breaths, and I found that my lips fit well around the nozzle to contain almost all of each breath into the pad. In the left photo below, the orange inner flap is deflation, and the green is inflation. The right photo below shows the two outer rigid covers closed. The thin inner flaps effectively keep air from reversing out of the mattress while I'm taking another breath, and if they get pushed inside they're easily nudged back out with a fingernail. I like a firm pad, so I always inflate to just about full capacity. (See photo in Product Overview showing the SynMat fully inflated.) 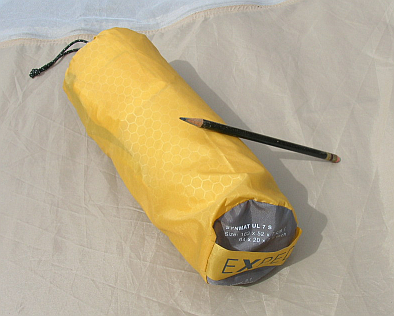 Exped makes an optional inflation pump, the Schnozzel Pumpbag UL M, which they recommend for easier inflation and to prevent accumulation of moisture from one's breath inside the mat's tubes. (It seems to me that bacteria, fungi, or other microorganisms could remain inside and possibly contaminate the air if it enters one's mouth again, but I'm not too concerned about it.) I opted not to get the pump right away since I have no problem using my breath, and there is a way to expel extra moisture (see Maintenance below). Unless there's a leak (described in Punctures below), there's normally no significant deflation by morning. However, there was the one time that I inflated my SynMat on a very warm 80 F (27 C) afternoon and got up the next morning to 35 F (2 C) and found the pad perhaps one-fourth deflated due to air contraction; however, there was still plenty of support for comfortable sleeping. Deflating and packing the SynMat is also easy. I just pull off the deflate cover, turn the pad around to the bottom end, and fold it over onto itself 3-4 times to get most of the air out. Then I lay it out flat again, fold it in thirds lengthwise (bottom towards me, so the deflate valve is uncovered at the other end), then roll it up tightly, expressing the remainder of the air. At this point the pad is a small enough package to easily slip into the stuff sack. I like my SynMat - I find it more responsive than a foam or air-foam pad for relaxing after a long day's hike and when sleeping, and it provides more cushioning against the occasional unavoidable small rock or tree root under my thin tent floor. However, an air mattress like this one does not provide much comfort for sitting - the air just moves to the sides. I also like the full length to stretch out on, compared to my previous three-quarter length foam pad. Although skeptical at first about the higher outside tube rails, they really do work for me: I definitely feel them and don't roll off the pad as much as I would without them. I'm pretty sure that the synthetic insulation in the pad has helped keep me warm when using a 40 F (4 C) down sleeping bag and a tarp tent that can be somewhat breezy at night. The pad will retain most of its air until the next night, but I usually like to top it up with a couple of full breaths for best comfort before lying down. Another nice advantage for me is the SynMat's small size when stuffed in its sack - I can slip it in my backpack's bottom compartment with the sleeping bag, pack rain cover, and other small items, leaving the outside of the pack unencumbered by a large rolled foam pad. I certainly didn't expect to be using the included repair kit so soon on just my second outing with the SynMat, but much to my surprise at the campsite I couldn't keep any air in. Luckily I had an easy section of creek nearby in which to dip the partially-inflated mattress, and I quickly found four punctures right in the center of the top of the pad (see photo). The repair instructions (with kit, right photo) recommended a quick fix of smearing a small amount of cement on the puncture, letting it dry to the touch, then cutting from the included material a small rounded patch about 0.5 in (1.3 cm) across and sticking it firmly onto the cemented area (the patch prevents the curing cement from sticking to other objects). I did this for each puncture and fortunately it did the trick, letting me have a good rest for the next two nights! This is a field repair; for longer repairs, Exped says to remove the patch and apply three layers of cement on each small puncture, which I have since done. So far, after about six more nights out, this repair method has held up perfectly. According to the instructions, larger tears and rips can also be repaired this way but I haven't had the bad luck to have to do this (knock on air!). After getting home, I realized that the four punctures were courtesy of my cat, who'd been wandering around the garage and jumped up onto the shelf where I kept the folded pad. The instruction manual even has a sentence warning about keeping the pad away from cats - advice now heeded! Of course, there will be trade-offs with an air mattress compared to other kinds of pads, especially foam. Despite its light weight, small stuffed size, and comfort, I wouldn't bring this along on a long-distance through-hike because of its susceptibility to punctures and the inconvenience of having to stop and fix them, or of running out of (or losing) the repair materials. However, for most of my 3-4 day trips I am happy to trade of bit of extra vigilance for a good night's sleep and a half-pound (220 g) savings in weight over my foam pad. I'm careful about any sharp objects in my clothes or in the tent. And, unlike foam-only pads, I never use the SynMat outside my tent on the ground. The Exped model I'm reviewing here is the ultralight version in their product line - there are other models made with more durable materials that may be more puncture-resistant, but heavier. As I would for all of my gear, I never store the SynMat rolled and stuffed for longer than necessary - I keep it loosely folded on a shelf (high up away from the cat!). 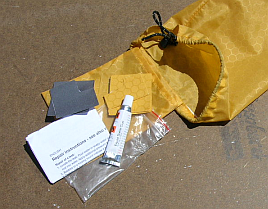 Because using one's own breath introduces moisture, Exped recommends their Schnozzel Pumpbag accessory instead (this would be necessary for a down-insulated air pad). I've seen it demonstrated at a retail store, and it's a nifty way to rapidly inflate the SynMat using hands only. However, with a synthetic-insulated pad like the SynMat reviewed here, following Exped's suggestion I have blown warm air through the mattress using a hair dryer (on its lowest setting) into the inflate valve with the deflate valve held open (watching the heat output so it doesn't melt the plastic). I'm quite satisfied with my Exped SynMat UL 7. Although it's priced near the top end of camping sleeping pads, it gets me a very comfortable night's rest, at light weight and in a small stuffed package that easily packs inside my backpack. Despite the obvious fragility of it's being thin-skinned, for shorter trips I don't mind taking extra care to prevent my SynMat from the embarrassment of punctures and leaks. I've found that field repair can be pretty easy to do when necessary.